Growing sunflowers attracts birds, bees and butterflies to your garden. I used to plant these sunny bloomers at my country garden for years, and it amused me each spring to find them in unexpected spots where birds dropped seeds. The bird-planted volunteers always made me smile in appreciation of nature’s happy accident. 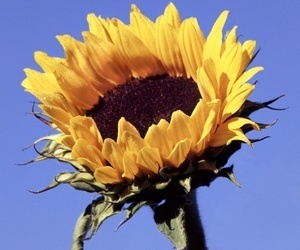 Just like their name, sunflowers adore full sun and warm weather. A North American native, this plant was a vital crop for native peoples. Today, sunflowers are still grown for food, and not just for birds: their seeds make a wholesome snack and are pressed into oil. Late spring is time to sow sunflower seeds indoors for a head start. You can also direct sow them into the garden once all danger of frost is passed. In recent years, sunflowers have come into their own as cutting flowers. There are lots of new cultivars in many shapes – from standard ray flowers to pompoms or fuzzy disks. Sizes range from dwarf to giant and as for color, that too now goes well beyond the standard sunny yellow into white, lemon, bicolors, and even dusky burgundy. Ring of Fire: An AAS (All-America-Selections) winner with striking 5-inch wide pollenless flowers; bi-coloured petals in dark red around a chocolate brown center taper off to golden yellow tips. Grows 4 to 5 feet tall; late-blooming. 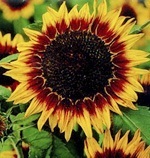 Claret: An excellent cutting sunflower that keeps its intense velvet burgundy color in the summer sun. Main stem grows 6 feet tall; produces side-shoots with lots of blooms. Eversun: A deep yellow, early-blooming pollenless type with big 10- to 12-inch ray flowers around a dark brown disk; flowers produced on one main stem. Teddy Bear: I’m generally not a fan of overbred flowers, but I’ve fallen in love with the sheer zaniness of this one. 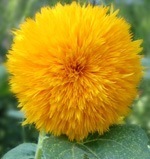 Has soft, fluffy, pompom heads that make handsome cut flowers; 2 to 3 feet tall with lots of flowers per plant. A perfect plant for a children’s garden (and anyone who is young at heart), as well as containers. Giant Sungold: At 5 feet in height with lots of flower-bearing branches, this is a taller version of ‘Teddy Bear’.